Natalie Barnes encouraged others to help the homeless in the city. A public transit worker in Milwaukee has been recognized for being an example this holiday season of Thanksgiving, after she was captured on bus surveillance helping a regular passenger who'd recently fallen on hard times. Natalie Barnes was driving a public transit bus on a chilly Oct. 13 evening when a rider with whom she was familiar named Richard boarded, according to the Milwaukee County Transit System (MCTS). He rode till the end of the line, the transit agency said, and then he and Barnes started talking as she took a break. On surveillance video taken from inside the bus, Richard tells Barnes that he is now homeless because his home has been condemned. She then asks whether it was the house he'd been staying in that, at one time, suffered a fire. "I've been out on the streets for a week," Richard tells her. Barnes offers to buy him some dinner. He declines but she asks him whether he'd like to ride the bus with her in order to stay warm. He agrees and video shows Richard riding along quietly in the back of the bus as Barnes covers her route, with passengers coming and going. We talk every couple of days and he thanks me every time he talks to me for helping him. He calls me his little guardian angel. I'm happy to say that he's progressing well. (Milwaukee County Transit System) Natalie Barnes was recognized by the Milwaukee County Transit System for helping a homeless passenger get food and place to sleep during her shift. It was her third commendation. At one point, the two are seen getting back on the bus with what looks like bags of food. "I don't know what to say but to say thank you," Richard tells her later. "I'll get it back to you soon." "I want to help you," Barnes tells him. Later, during another break, Barnes can be seen on her phone. The transit agency said that Barnes had reached out to a friend who helped get Richard into a temporary shelter. When the video picks up a few moments later, Barnes, back behind the wheel, asks Richard whether he needs some items from a store she plans to visit the next day. As he exits the bus, she tells him to let her know how he's doing. "Keep me posted," she says as he nods. "Let me know what happens -- even tonight." "See you tomorrow," she says. In an interview during a ceremony in which she was honored by the transit agency, Barnes said she was moved to help Richard because he was an elderly man and it was cold outside. She said she saw Richard at least once a month. "It was important that he found somewhere warm to stay for the night, at minimum," she said. Barnes, who has been driving with the transit agency for two years, encouraged the community to help when it comes to the homeless. She said in the area that she covered as a public transit driver, there were "a lot of people who are looking in garbages for food." "They're underdressed," she said. "They don't have anywhere to go. ... They need help. They should have basic necessities like food and like clothing just to survive." After that six-hour bus ride, Barnes said Richard had become a friend of hers and even now has her cellphone number. "We talk every couple of days and he thanks me every time he talks to me for helping him," Barnes said. "He calls me his little guardian angel. I'm happy to say that he's progressing well." The transit system said that Barnes, a mother of two, was also known for bringing extra sandwiches on her shifts. 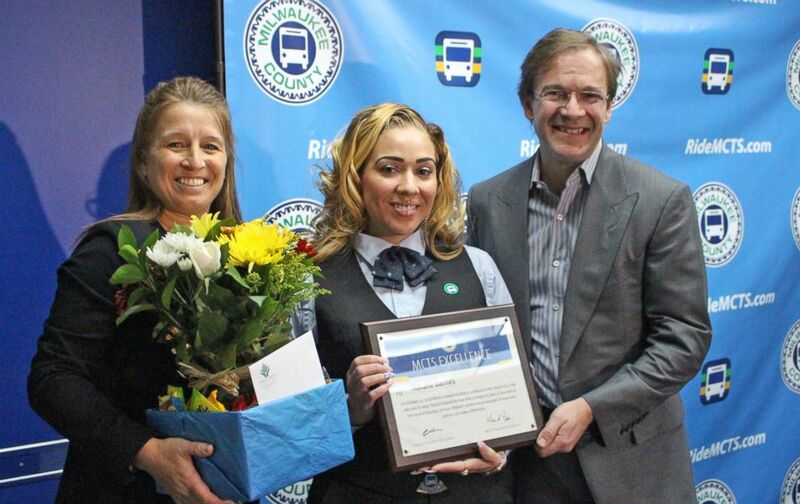 This was her third commendation for outstanding service, according to the transit agency. Community Advocates, a local agency, has also found Richard permanent housing.